Aventura Movers – Discount South Florida Movers understand how stressful moving can be. That is why we strive to keep your worries to the absolute minimum by treating each of our customers in a friendly manner and handling their possessions with the utmost of care. With more than fifteen years of expertise, Discount South Florida Movers has been providing quality service to Aventura and all of our Florida customers at the lowest rates in town. We cover all of your packing and shipping needs whether it is a residential or commercial move, local or long distance, our team of professionals can accommodate all your moving requests. We can even move your piano for you personally. Whatever you needs are, we guarantee to have your valuables delivered to their destination in a safe and timely manner. Aventura is a medium sized, planned suburb of 35,000 people. Located in the northeastern section of Miami-Dade County the town was incorporated in 1995. The city boasts many attractions, from Aventura Mall, the fifth largest shopping mall, to the Turnberry Golf Course, and their Country Club Drive Circle, a three mile horticultural promenade. It is also home to the award winning City of Excellence School. The charter school was opened in 2003 and has been named one of the top 10 schools in all of Florida. The Tri-Rail commuter rail might also start running trains through it and follow US 1 to Miami. The great schools, proximity to Miami, and the expansion of the rail make the city a desirable location for anyone to live. 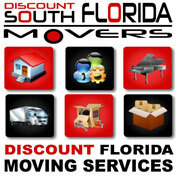 Discount South Florida and Aventura movers provide low rates on residential, commercial, piano and long distance moving.